Ok, I’m so crazy about Tak, he could have gotten me a ring like one of those old Cracker Jack box prizes; you know, like on from the movie Breakfast at Tiffany’s (don’t pretend you’ve never seen it … hehe). 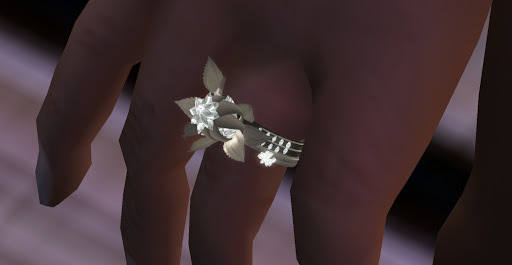 But my man got me an engagement ring to show his love but also to acknowledge what I do in Second Life, meaning my work as a gardener. And if you want to connect some dots, it was my Zen garden that initially brought Tak and I together. I think you’ll see the symbolism in this lovely ring. Thank you Tak baby. A beautiful floral arrangement with diamonds, the most gorgeous ring I’ve ever seen.